Doctor Who rarely does big character arcs. By its very nature it’s a transitory program: every week a new adventure, every few years a new Doctor and new companions. That means that a character, especially the Doctor, is established quickly and stays like that till they leave. But this weekend’s season ten finale put a wonderful bookend on an evolution that’s been in the works for all of Peter Capaldi’s time on the show. Peter Capaldi’s run on Doctor Who could arguably be defined by a much stronger series of thematic arcs—especially for his first companion, Clara, who went on a journey of learning how to be more and more like the Doctor, before the recklessness that can come with travelling with him got her killed (aside from the whole “frozen in the moment before her death to run off with Arya from Game of Thrones” thing). But “The Doctor Falls” is actually all about wrapping up an arc that’s been bubbling away for much longer than one season. One that’s been key to Peter Capaldi’s portrayal of the Doctor. When the Twelfth Doctor first arrived on the show, there was much talk of how much darker he would be—and season eight gave us a Doctor harsher and more standoffish than we’ve seen in years, full of disdain for the idiots he has to save around him and running around with Clara as his carer, who cares so he doesn’t have to. Season nine, while taking Clara herself down a darker path, saw the Doctor soften up and warm up to his role as a protector and savior, with the realization that he regenerated with the face of someone he’d saved out of kindness as a reminder to keep him honest. Season ten, meanwhile, has been all about putting that into practice, not just in the people the Doctor fights to save, but in his tutelage of Bill not as someone to become more like him or to be his emotional translator, but as a friend. “The Doctor Falls” crystalizes that journey with another base under siege, a Who story trope that feels like it’s been a much stronger part of Capaldi’s time on the show than it has any other modern Doctor. This time, a solar farm of survivors on a Mondasian colony ship that, thanks to a black hole creating timeline dilation, has lived for years as its own self-sufficient community, avoiding the existential crisis that turned their former fellows to the genesis of the Cybermen on the lower decks. From the get go, it’s presented as an unwinnable scenario. The time dilation has led to the Cybermen to evolve into their militaristic, Iron Man-esque forms seen in recent series, making them a much deadlier force than the shambling half-conversions the colonists had previously dealt with. And even if the Doctor and his gang could do anything to help them, it would only be delaying the inevitable, moving them up to a solar farm higher up in the ship, giving them a bit more time before the Cybermen regroup and hunt them down again. The Masters—who spend much of their time dancing around each other trying to figure out exactly what the other is up to a wonderful tête-à-tête between John Simm and Michelle Gomez—instantly decide to run away from the unfavorable odds and make their way back to their own TARDIS, leading to a character-defining, soul-stirring plea to them from the Doctor that finally answers the question he’d been asking of himself pretty much since his regeneration three years ago: whether or not he’s a good man. And the answer is that he’s willing to stand, willing to fall so that complete strangers to get a chance to survive another day, not because he’s a warrior or because he’s angry, but because he is kind. It’s a moment that will likely define Capaldi’s time on the show, not just because it’s another of his heart-rendingly performed barnstormer speeches, but because it is the ultimate resolution of the journey this incarnation of the Doctor has gone on. 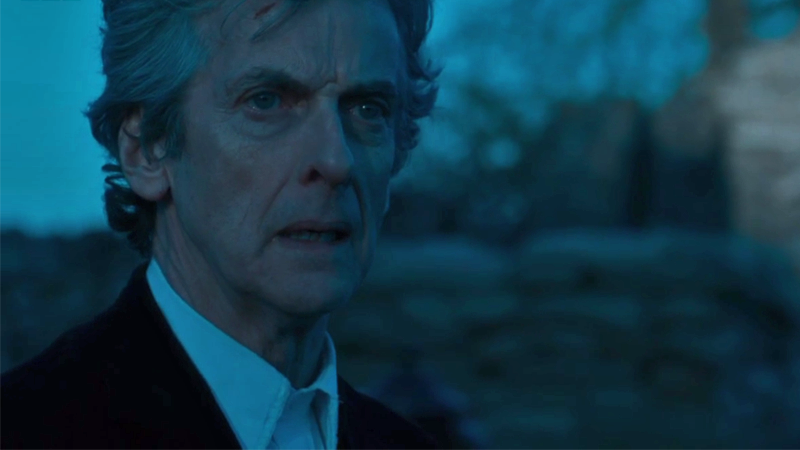 It’s taken three years, but he’s grown from a man who doesn’t care to a man willing to die because he cares so much—and one that, when he’s about to regenerate, is so furious at the prospect of becoming someone else and having to potentially re-learn that whole journey again, demands to just die so his growth, his act of kindness, can truly mean something. “The Doctor Falls” isn’t just about the Doctor himself accepting death—it touches pretty much every main character in the episode, neatly wrapping a bow around a lot of Steven Moffat’s time on the show. There’s Nardole, given the task of safeguarding the colonist’s journey to the new solar farm and looking after them, essentially consigning himself to a later death when the Cybermen regroup and find them on a higher floor of the ship (I really hope that now the Doctor has TARDIS access again, he goes back and saves them at Christmas!). There are the Masters themselves, who both go out in a blaze of gloriously Master-y betrayal of each other: Missy, accepting her change to good, killing her past self so he can begin his own process of rehabilitation as her, and the Master then killing her, allegedly permanently, as one last act of vindictive spite that reflects his own unwillingness to accept that he, like this incarnation of the Doctor and Missy, could change. And then there’s Bill Potts, who gets the happy ending that no one else in this episode can. It’s one that comes out of unspeakable horror, with her mental barriers breaking down and realizing the cybernetic monstrosity she’s been transformed into—but it also comes out of the fact that, like the Doctor, she’d rather die if she can’t continue being the person she had become thanks to her time with him, fighting back against the Cybermen’s programming to stand with him against them. The space puddle ex machina of the Pilot from the first episode showing up to transcend her to another plane of existence feels almost like a reward, in that way, even if it is a bit of a cop out: Bill’s acceptance of her end paving the way to the next step in a journey she has to take without the Doctor and as a wholly new being. Doctor Who’s tenth season has been cut with an underlying theme about the value we place on a single life—how awful it can be when that value is discarded, how destructive clinging on to it can become, and ultimately, the honor and integrity involved in choosing to give it up for a noble cause. As we head into one final adventure with Peter Capaldi at Christmas, it seems like the final lesson this Doctor must learn is that sometimes there’s just as much honor in carrying on (albeit with a new body) as there is in falling for your principles—as lesson he’s going to learn from someone who’s got all that to experience ahead of him. Sure, it was done to keep Pearl Mackie in the episode as much as possible, but having Bill around as that’s how she still perceives herself cut in to everyone else seeing the Mondasian Cybermen she has been turned into was stunningly effective at getting across the tragedy of the Cybermen as a concept. The Doctor quotes a ton of past locations of past Cybermen stories as he goes out in his explosive blaze of glory—Mondas, Telos, Planet 14, Voga, Canary Wharf, and even the Moon itself. But he also mentions Marinus, which has only every appeared in one story: 1964's “The Keys of Marinus,” two years before the Cybermen were first introduced. I wonder why he mentioned it? Steven Moffat is now three for three in “Companion dies but not really” story conclusions. While Bill’s is the closest to an actual death—she still went through the horror and pain of being shot and then converted into a Cyberman, she just transcended to a different form of existence afterwards—it’d be nice if we got a companion who left the show for a reason other than their kinda-sorta death. With the Christmas special seemingly using the First Doctor to help the Twelfth come to terms with regenerating again, I wonder just where in his timeline this First Doctor is from—and judging by the snowy environ the Doctors are in at the end of the episode, how close Doctor 1 is to his own “renewal.” After all, there never really was a proper explanation for how he began his own regeneration in “The Tenth Planet”, with fans theorizing possible outcomes to fill the gap like Mondas’ energy field draining him. Could the Christmas special see not one, but two regenerations, two Doctors struggling to accept their inevitable change?